It's a Christmas version of "Gorilla-Man-Gun" It has been a great hit with my MS/JH over the years, and is again with my 2 new groups (5th/6th grade and 7th/8th grade) that I lead. Two people line up back-to-back. On the count of 3, they turn around and mime, "Santa," "Rudolph" or "Frosty." For Santa, you make a beard with your hands under your chin. 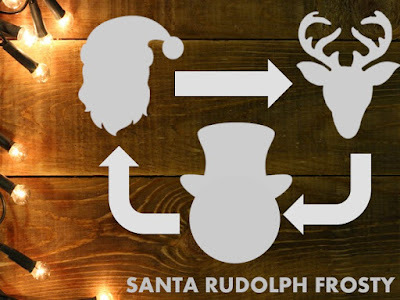 For Rudolph, you make reindeer antlers with your hands. For Frosty, your make a carrot nose with your hands. Santa, of course, beats Rudolph with a whip...Rudolph beats Frosty, because he kicks him over....Frosty beats Santa, well...just because. Loser sits. Winner finds a new partner and the rounds continue eliminating people until there is only one person standing. It is great time killer and filler. Our group really gets into it, especially the junior high boys! Feel free to "right click" and save the graphic above or create your own! * Written a long while back for Youth Worker Magazine!